There's nothing like getting together with a group of talented coaches and working on skills none of you yet possesses. 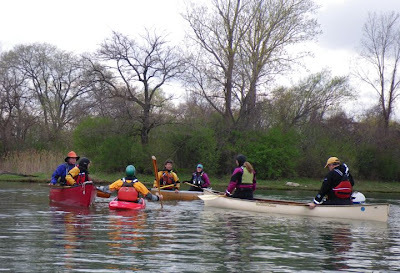 Last Friday, Scott Fairty took Paul Redzimski, Wendy Madgwick, Bonnie Perry, Lyn Stone, John Martin and the two of us out on the water for a Canoe Two Star assessment and an update of our old BCU Canoe Safety to the new Foundations of Safety and Rescue. That sounds heady and intimidating, and it might have been if not for Scott's laid-back style and the enthusiasm of the group. 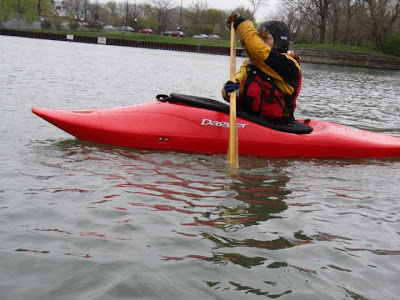 It certainly helped that all of us are experienced paddlers with a general level of comfort on the water in any type of boat. So what if we didn't yet know our J stroke from our C stroke? We picked them up fairly quickly. Everybody's learning style was readily apparent. The verbal processors talked through everything prior to trying anything; the kinesthetic learners dove right in--sometimes quite literally. And Scott was the ringmaster, calling out the acts and letting us go at it. Or main motivation for the assessment and update was our upcoming BCU Coach One assessment, for which these are prerequisites. What surprised us, however, was how much fun we had learning and demonstrating our new-found skills. 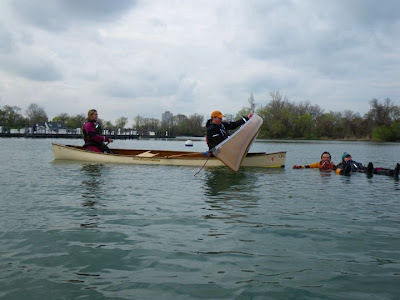 Then again, it's nearly always good to be on (or in) the water. Click here for the full slide show.